"No act of kindness, no matter how small, is ever wasted." From The Lion and the Mouse, by Aesop. 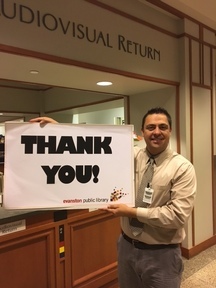 We are grateful to all of our library patrons for your visits, support, comments, library love, and contributions. From all the staff at Evanston Public Library, we wish you a Happy New Year! Fine forgiveness applies only to gifts made online. If you want to participate but do not want to give online, please call 847-448-8653.